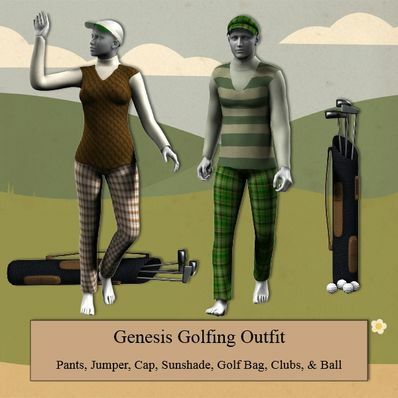 A Golfing Outfit for Genesis for use in Daz Studio 4.6. I have at last upgraded to DS4.6 so I am afraid that this will NOT work in DS4. I'm sorry about this, but there was so much new stuff I wanted to buy, but could only use on DS4.6.Several textures for each item. I can't get over what a complete golfing outfit with all the props including the golf ball! You are amazing, thanks so much.